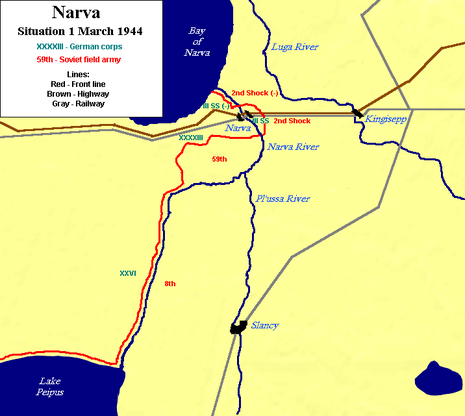 The Battle of Narva was a military campaign between the German army detachment "Narwa" and the Soviet Leningrad Front fought for the strategically important Narva Isthmus in 2 February – 10 August 1944. 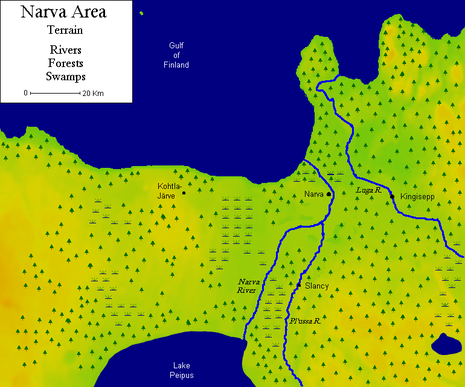 The campaign took place in the northern section of the Eastern Front and consisted of two major phases: the Battle for Narva Bridgehead and the Battle of Tannenberg Line. The Soviet Kingisepp–Gdov Offensive, Narva Offensives (15–28 February, 1–4 March, and 18–24 March) were part of the Winter Spring Campaign of 1944. Following Joseph Stalin's 'Broad Front' strategy, these coincided with the Dnieper–Carpathian Offensive. 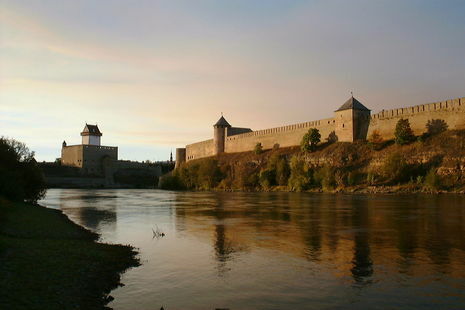 As a continuation of the Leningrad–Novgorod Offensive in January 1944, the Soviet Estonian Operation pushed the front westward to the Narva River, aiming to destroy the army detachment "Narwa"and to thrust deep into Estonia. The Soviet units established a number of bridgeheads on the opposite bank in February. Subsequent attempts failed to expand. German counter attacks annihilated the bridgeheads to the north of Narva and reduced the bridgehead south of the town stabilizing the front until July 1944. The Soviet Narva Offensive (July 1944) and the follow-on Battle of Tannenberg Line were part of the Soviet Summer Autumn Campaign of 1944, coinciding with the Lvov–Sandomierz Offensive. The Narva Offensive captured the city and forced the German forces to retreat to their prepared Tannenberg Defence Line in the hills of Sinimäed 16 kilometres from Narva. In ensuing fierce Battle of Tannenberg Line, the German army group held the line. Joseph Stalin's main strategic goal — a quick occupation of Estonia as a base for air- and seaborne attacks against Finland and an invasion to East Prussia — was not achieved. As a result of the lengthy German defence, the Soviet war effort in the Baltic Sea region was hampered for seven and a half months. A number of foreign volunteers and the local Estonian conscripts participated in the battle as part of German forces. 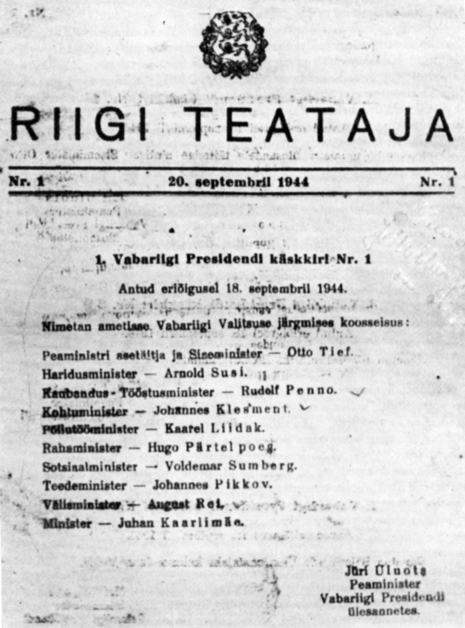 By giving its support to the German illegal conscription call, the Estonian resistance movement had hoped to recreate a national army and restore the independence of the country.